As a designer I sit at my desk most of the day. I always have a coffee or water nearby. One issue I have when I make a coffee and sit at my desk is it getting cold. I get in the zone and usually forget it’s there. At least four times a week my coffee sits and loses its heat. All that can change with The Ember Smart Coffee Mug. This nifty device syncs with an app that allows you to set the temperature. The coaster acts as an inductive charger to make sure the cup continues to keep your beverage warm. The Ember Smart Mug is the one gift for any designer who loves to warm their morning, afternoon, or evening drink while they work. Twelve South is dedicated to making some of the coolest Mac accessories on the market. They share Apple’s attention to detail as well as their love of aluminum. They make everything from cases to mounts, but the one thing you wouldn’t expect is a candle. Last year Twelve South release the new Mac scent, a beeswax candle that was made to emulate the smell of opening a new Apple product box. It was a clean smell that put me in a good mood when lit. This year they are at it again with their second candle “inspire”. Housed in a clean white glass jar and the signature Twelve South red, it would look perfect on any desk. Considering the mood last year’s candle put me in, I am definitely going to stock up. What designer can’t use a little inspiration in their office? In 2011 Apple introduced Siri the first mainstream digital assistant. It was conveniently located in your phone, but in its infancy it wasn’t as useful as today’s voice assistants. Fast forward to 2017 and digital assistants are in our phones, tablets, computers, and a new category: smart speakers. I am waiting for Apple’s HomePod, but with options from Amazon, Google, and even Sonos it is easy to choose which best suites your needs. I wrote about how useful a speaker can be in a blog post back in July. Show your designer some love with a new employee, without the overhead costs. The technology boom comes with its own headache, wires. Everything we buy comes with an adaptor and a charging cable, but recent phones have started to introduce wireless charging. Apple joined the party with the release of the iPhone 8 and iPhone X, but some android phones have had this feature for a few years. This nifty little pad keeps your phone charged without the mess of wires. There are tons of options, even some built into a desk lamp. Help your creative stay charged and ready to go. I get a lot of questions from people who ask me how I use my Apple Watch and if it is useful. Is it useful: yes. How do I use it? Besides the health implications it helps minimize distractions from my phone. I do everything from clocking into projects to glancing at messages, and without the lack of distraction from leisure apps like Facebook or the newest game everyone is playing. It reminds me to take a break to breathe and meditate as well as when I should stand to prevent sedentary. The release of the Series 3 includes LTE, so now you can go for a run and still receive emails or calls without being tied to your phone. It can also tell the time. Appearances are everything, and even in today’s digital world meetings are inevitable. Whether it’s via Skype or in person your potential client will eventually see you. 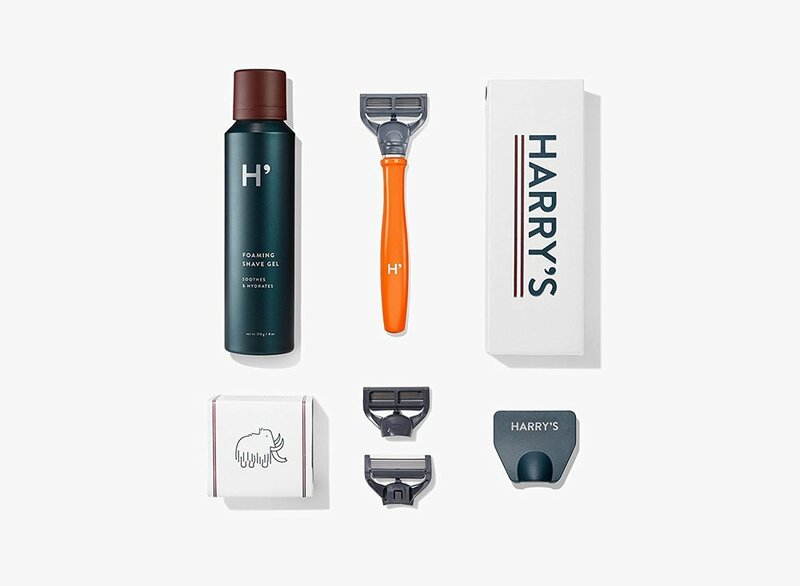 For the male designers in your life there is the Harry’s Shave Plan. A low cost high quality razor made in New York. You can receive a free trial for the plan which includes a razor, razor handle, a razor cover, and shaving cream. The German engineered blade refills start at $1.47 per blade. The blades are so smooth my wife actually started using them for her legs as well. Be ready for every meeting with the Harry’s Shave Plan. Just like most professionals, at times designers have to travel to client meetings or to attend a conference. I usually travel with a lot of technology which can be a bit of a hassle. The Away Luggage comes in a few size options and even more color choices. A compartment for clothes which has a built in separator for clean/dirty clothes, a side for toiletries, a special zipper lock, and its own charging port for electronics make this one versatile luggage. If you know the traveling designer, this Luggage would be an amazing gift. When it comes to meetings, I never go empty handed. As a remote worker I usually travel with my iPad, a few small moleskin notebooks, an Apple Pencil, pens, a metal ruler, chargers, credit card readers, and a few other tools that I don’t like leaving home without. When you rely on public transportation you need a great backpack. At the top of that list is a Herschel backpack, it’s both practical and fashionable. With colors and prints from traditional black to leopard print, these backpacks and bags allow you to hold all your tools and toys. What’s better is Herschel doesn’t stop there. They have a full collection of wallets, messenger bags, duffels, luggage, and even totes to coordinate or mix n’ match. When it comes to high quality backpacks Herschel Supply is my go to choice. I have religiously used Moleskine notebooks for most of my brainstorming, but recently I have come across the Grids & Guides notebooks. What makes these notebooks different is that they are made specifically for designers. Grid patterns ranging from standard to isometric allow designers to effectively design logos and layouts, while including charts and infographics to inspire ideas. Princeton Architectural Press makes a standard sized notebook, but also has pads, tracing paper pads, a large desk pad, and pencils. These brainstorming tools will make any designer smile. Last year’s big Apple announcement was the AirPods. I wasn’t too excited about these when they were first released, but I finally came around to purchasing them. They were pretty rare and hard to find, but I was able to find them in July. It has been one of the best purchases I have made. I wrote a full review about how I use them for productivity around the office back in September if you want to learn more about the AirPods. Show your ears some love this holiday season. The bento box is the Japanese version of a lunch box. What is really inventive about this design is it compartmentalizes a lot of food in a small space. The folks at Function 101 decided to use this design and turn it into a tech accessory caddie. There are eight total compartments that will store everything from chargers and wires to Apple Watch bands or an Apple Pencil in a special tray between layers. It’s available in black, silver, or rose gold to match your Apple devices and can be can preordered on Indiegogo today. When it comes to a mobile powerhouse I have definitely touted the new iPad Pro as the go to device. Back in September I wrote a complete review of the way it is now handling most of my workflow, but the iPad Pro alone won’t get you the ultimate mobile set-up. I unlocked it’s true potential with the Magic Keyboard, Apple Pencil, & the iPad Leather Case. It’s an expensive gift, but one that is perfect for your beloved designer or digital nomad. Designers love two things: fonts and colors. Pantone is the industry leader for color development and helping designers match that perfect selection from print to digital. They have tons of options for designers including individual Swatch Sets, Chip Binders, and Light Booths, but the creme de la creme is the Pantone Reference Library. A complete set of Pantone Reference tools including nine fan deck guides, five chip books with two of each color tile, and a display to hold everything. It is a dream to have the complete system and would be on most designers wish list. Sometimes designers need to give a presentation, but sometimes the venue isn’t set-up with the proper equipment. The Miroir HD Mini Projector allows you to display a presentation anywhere there is an empty wall. With the ability to display from 20”- 80”, it gives you the ability to present in front of a small group or a medium crowd. Measuring in at less than 6” this little piece of tech is a must have for the digital nomad. Having a mobile device can be limiting at times. About a year ago I discovered the SanDisk Connect, a standard usb thumb drive with a surprise. It actually holds its own WiFi signal and can connect to three devices at a time. My workflow starts with a design created on my studio desktop that I have transferred onto the drive. When I go out to work remotely I bring the SanDisk along, fire up the connection, and use the app to instantly access the files from earlier. I put all my current projects on the drive so I have access anywhere at anytime. This is just another tool that makes a designer’s workflow a bit more seamless. Maybe one of the most expensive single items on this list, but with great reason. This is the tenth anniversary of the iPhone and beyond the most noticeable change, the full screen front, comes new specs and functionality. A key feature with the iPhone X is the addition of AR (Augmented Reality). I think this is going to be a key area designers will need to learn moving forward. Back with Google Glass, AR was a way of receiving information in the world around us. Things were a little creepy with Glass, but it’s matured and is making its way to iOS, Android and Windows systems. To foster designers of the future, and our own evolving careers we need to familiarize ourselves with these new types of tech, which is why I chose the iPhone X for a great gift of the holiday, plus it’s just a slick looking phone. 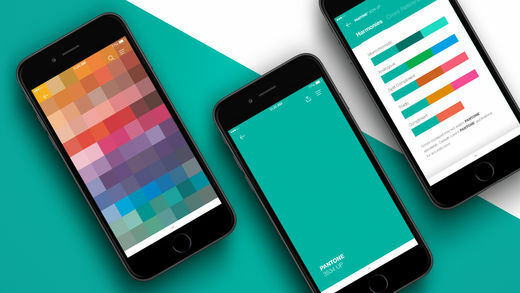 Another entry from Pantone takes a look at their digital apps for iOS and Android. It is a handy tool to have on your phone and will even allow you to reference a photo to match a Pantone color. Another must have for any designer or creative. Learning new skills is the best way for designers to stay on top of their game. Whether you are a seasoned designer who wants to brush up on some skills or a new designer who wants to learn the basics, Skillshare is the best option on the market. Classes are taught by industry experts like Ellen Lupton, Paula Scher, and Aaron Draplin. A collection of quick classes that at $9.00 a month is a steal. Try 2 Months free of Skillshare Today! One thing I used a lot was a Wacom tablet. When I purchased my original 12.9” iPad Pro I really wanted to use it as a replacement for my Intuos. I’ve never had the Cintiq, but figured the iPad could essentially act as one. Astropad makes that possible by turning your iPad into a powerful editing tablet. Though I love the portability of my 10.5” Pro I am thinking of buying a used 12.9” to use specifically for this function. The larger model is the ideal size for that type of work, and anyone with the bigger Pro will find this app extremely useful. Adobe Capture is a free app that is basically a designer’s idea book. There are six sections: shape, type, colors, materials, patterns, and brushes that sync to different Adobe app libraries. This mobile centric app lets you capture the world around you and make vector shapes, textures, brushes, and even customize your own font. You can pull inspiration from anything you may be around while syncing with the desktop and mobile apps instantly. It’s definitely a tool anyone with an Adobe CC account should have. A great app that showcases typography by class, designer, name, year and usage. Letting the user explore fonts down to the artist, and more fonts by that same artist. It is a visual encyclopedia to the world’s most famous fonts. It also allows you to use this tool with clients to get an understanding of fonts they like. The intuitive UX makes you feel like your diving deeper into the world of typography. FontBook will make any typography loving designer smile. Another year is in the books. This year’s list covered some tools that would help a designer in the studio, working remotely, and during a meeting. Even though this is a holiday list, these would make great gifts during any part of the year. Remember to subscribe to the Bigger Design Blog Newsletter to get your monthly blog recap. Stay up-to-date with the latests blog posts from the past month. We respect your privacy. and will never give out your information. Thank you! This newsletter will be going live in January. We will see you then. Brian Anthony is the Creative Designer at Bigger Creative. A comic book nerd who loves everything about design and technology. Born and raised in Brooklyn, like most New Yorkers, he isn't afraid to speak his mind. Brian is an outgoing designer who has had his work featured in USA Today, New York Fashion Week, and CES. He finds inspiration in everything and loves to throw on some music and get to work.